Look, I was only 1.45 CM long! That's the size of a big fat GRAPE! I've been feeling a lot better the last five days. Like, a LOT better. Hopefully it'll stay that way. Abortion can be argued day and night, with both sources citing from their respective biased websites and sources. But what it comes down to isn't my source said this but your said that, it's emotions and facts. If I were hit by a drunk driver today, by myself in the vehicle, that man would be charged with two counts of murder. If a woman was on her way to an abortion clinic and was beaten and stabbed on the way there, and the child is miscarried, her attacker would go to prison for something she was about to pay to have done. An unborn child has the right to be protected from its crack addicted mother, but not from its intentionally murderous mother. 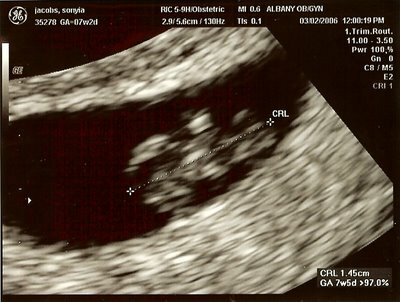 And for those of you that can see that ultrasound picture... That is MY BABY. At seven weeks and two days old. Many women are just now finding out they're pregnant, or have known for a week and are now saving money to get rid of their "problem". Today, I sat in the doctor's office, and I looked at that ultrasound... we saw a heartbeat, and then the doctor hilighted the area and we heard it. A human heartbeat, 150 beats per minute. That's a miracle right there, and any woman that's blind or dumb enough to call that a "blob" will be personally hunted down by me and beaten half to death. Most of my baby's major vital organs are formed, though most don't start functioning for another week or two. I'm just sorry that women can't see their baby in better detail with today's technology, so they're led to believe that it's just... a blob... but look, you can clearly see the head, the body and tail... who can deny THAT? It's a human being.